Today I have a comparison post for you all. Whenever I’m out buying new polishes, I sometimes tend to forget what I already have and will accidentally buy polishes that look exactly like ones I already own. It drives me crazy when I do this, since I would obviously prefer to have more different colors than a bunch of the same looking ones. 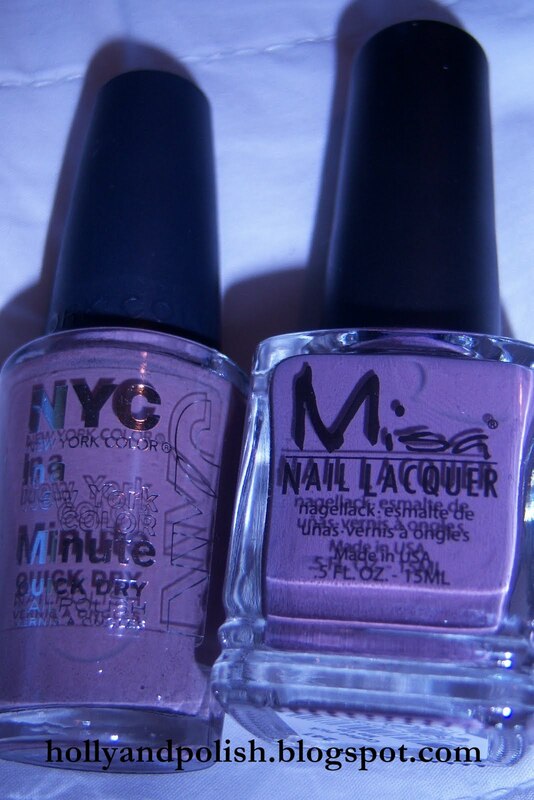 The colors I’m going to compare today are Coffee Pick Me Up by Misa and Park Ave by NYC. From the bottle, Coffee Pick Me Up looks slightly darker and a little bit more plum looking; However, when I swatched them on my nails, I think they look pretty much the same. (Park Ave might have a tiny bit more of a grey shade to it, but I don’t think the difference in the colors is noticeable.) These shades are so similar, I probably could have walked around all day with both colors on my nails and no one would have noticed. Formula wise, Coffee Pick Me Up is definitely a thicker polish and went on a bit smoother than Park Ave. For the swatches, I ended up using two coats of Coffee Pick Me Up and three coats of Park Ave. I purchased NYC Park Ave for $2 and Misa Coffee Pick Me Up for $3.75.